October 20, 2014, Boston: A woman bikes down the Esplanade. Photo by Munizay Paracha. Freezing or panning action is dependent on your shutter speed. To capture fast moving subjects such as cars or sports, you need to use a fast shutter speed. 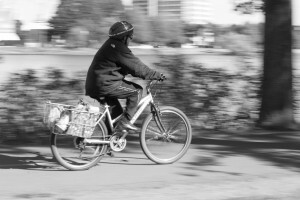 To blur the background behind your moving object, set your shutter for 1/30 of a second and use panning technique. Part one of this assignment is an exercise in freezing motion. 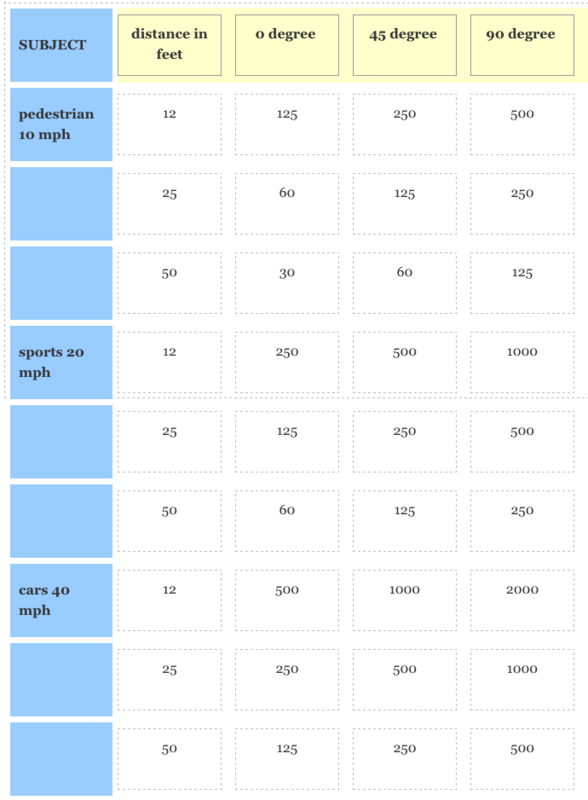 Refer to the chart below to pick shutter speed for freezing action. Manual focus is best, but feel free to experiment with auto focus. Pre-focusing on spot where you anticipate the action going is effective. Part two of this assignment is an exercising in panning. Panning is a technique that allows you to create a motion-blurred background effect, creating background movement while keeping your subject sharp. 1. Pre-focus on the spot directly in front of you where your subject will be when you start the exposure. 2. Stand firmly with the camera to your eye and slightly twist the upper part of your body in the direction from which the subject will come. 3. Begin following the subject as soon as it appears in the viewfinder. 4. When the subject reaches the spot you have selected, release the shutter and continue following it in one smooth movement. 5. The background should be of uneven tones and the path of motion should be as parallel as possible. 6. Use the slowest possible shutter speed, use meter to determine f-stop. Bracket the shutter speeds for different effect, 1/15 to 1/30 tends to work the best. • Shoot from one of the footbridges and at the beach on Storrow Drive. Upload six images from the three location shoots. The three sets of images should show panning and stop action from each situation. Remember panned shots must be photographed as parallel to the action as possible. The Chart below provides general guidelines for stopping motion.